Surrounded by a 23-acre man-made lake and located on the 17 Bypass between 29th Avenue North and 21st Avenue North, Broadway at the Beach is home to a variety of specialty shops and boutiques that make it a favorite shopping, dining, and entertainment venue for both locals and visitors. This 350-acre mega-entertainment venue is centrally located in Myrtle Beach with easy access from any direction, and has three distinct sections: The Caribbean Village, the Charleston Boardwalk, and the New England Fishing Village. 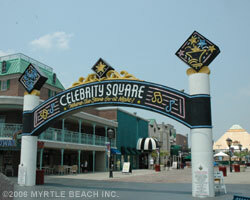 Broadway at the Beach is home to NASCAR Cafe, Jimmy Buffet's Margaritaville, Planet Hollywood, Hard Rock Cafe, Senor Frogs, and other top restaurants. Ripley's Aquarium, Magiquest, the IMAX Discovery Theater, and the Palace Theater are also located at Broadway at the Beach, offering outstanding family entertainment. There's so much to do at this place, that many vacationers choose to stay at one of the hotels on or near Broadway at the Beach. Accommodations at Broadway at the Beach: Hampton Inn, Fairfield Inn by Marriott, and Holiday Inn Express.